I love to travel every now and then, but when it comes to unwinding, I'm more than happy to just enjoy a "Staycation" in the city. One place that I highly recommend staying at, is one of the newest in Makati, and is strategically situated right in front of the Greenbelt Complex, making it possibly the best location in Manila. I'm talking about Makati Diamond Residences, one of the most impressive hotels in the country today. Rising tall in the heart of the bustling Legazpi Village, is Makati Diamond Residences, a 28 floor monolith that houses 410 guest rooms, and a whole slew of amenities that redefines everything you thought you knew about luxury living. ..As it gives you a picturesque view of the beautiful concrete jungle that is the Makati City Business District. Whether it's for work or relaxation, whenever you stay at Makati Diamond Residences, make sure to available of access to the Club Lounge. Our room for the weekend was this luxurious, fully equipped one bedroom suite. The room offered a comfortable living room area that featured a an incredibly relaxing couch (that can serve as another bed.. Speaking from experience.. darn that afternoon nap was awesome), and a small dining room. Another thing that sets serviced apartments, is how it has a kitchen that would make any home cook drool. Makati Diamond Residences has a spectacular one in their rooms. The gorgeous bedroom was so inviting, making it difficult for me to leave our apartment and check out the other facilities Makati Diamond has to offer. Makati Diamond Residences also houses a state of the art fitness center, that is equipped with some of the latest excercise equipment and weight machines. But not only do they have a Fitness Center, but a TRX Studio as well, for your Suspension Training sessions. Housed within the walls of Makati Diamond Residences, is a magnificent indoor Lap Pool, which is arguably among the largest the country has to offer. What makes having an indoor pool so genius is that the elements are never a factor. How much time have you wasted at a hotel waiting for the sun not to be so hot, or even worse, waiting for the rain to stop? Well on this day, there was a light drizzle, but that didn't stop Rain and I from heading to the pool for a fun Father and Daughter bonding time! Just outside the indoor pool area is the Pool Bar, where guests can enjoy refreshments after their swimming session. One of the amenities that makes Makati Diamond Residences different from all the other hotels in the country, is that it is to my knowledge, the only one that has their own dedicated Mini Theater for their guests. Lined with ultra comfortable Lazy Boy Recliners and Leather Seats, the mini theater was a dream. If you're looking for a relaxing place to lounge, then the Whiskey and Cigar Bar will be your new favorite place to hangout, and it's open from 4pm to 12 midnight. Whether it's for an important board meeting or a lavish banquet, Makati Diamond Residences has a wide range of Function rooms for you to choose from, that will fit your needs. My favorite place to hang out in at Makati Diamond Residences was most definitely the Club Lounge. In the afternoon, Afternoon snacks, such as Cookies, Assorted Nuts and Jelly Beans are freely available. However at Dinner time, the set up offers heavier items. In the morning, a breakfast nook is set up, in case you prefer enjoying your morning time away from the bustling crowds in the cafe. The choices may not be as extensive as those downstairs at Alfred, Makati Diamond Residences Flagship Restaurant, however it has the breakfast essentials that I looked for. Starting of course, with delicious bacon. A medley of sausages prepared different ways. Including an amazing Italian Garlic Sausage. If you're looking for lighter fare, you may have pancake, french toast and the like. Rina was blown away with their Laksa, and dubbed it one of the best she's ever had. As well as a selection of Breads and Breakfast pastries. Health buffs will be happy to know that they can get their fruits and vegetables here as well, and customize their our salad or fruit platter. Makati Diamond Residences' flagship restaurant, Alfred, offers a wide array of Continental cuisine choices. And my order was the delightful Roasted Lamb Loin stuffed with Goat Cheese Ratatouille, Potato Rosette, and Black Olive Jus. The Mango Bavarios with Macaron in Passion Fruit Sauce was also a great plate cleanser to end the meal. Beginning last July, Friday nights at Alfred gave its guests a taste of France, with it's "Bon Vivant Fridays". For the incredibly reasonable price of only P1,200, you hace unlimited access to a French themed buffet, including wine and other cocktails. Some of the items you can enjoy at Bon Vivant Fridays are..
Smoked Salmon Roulade, which is made with thin slices of Freshly Smoked Salmon, stuffed with Cream Cheese. A popular french dish, Farmer's Pâté en Croûte, which is essentially Pâté, wrapped in a pie crust. You can also have the Fish Brandade, which is Salted Cod with Olive oil, best enjoyed when spread over a crisp garlic infused toast. For our main course, on display was a glorious Seafood en Croute. One you slice through the incredibly buttery, flakey crust, a creamy seafood mixture is revealed. However, the star of the evening seemed to be the Raclette Station, which was heated and scraped right on to your plate..
Then served with a baby gherkin, marble potatoes and crostini. Makati Diamond understands that part of the charm of staying in Legaspi Village, is the charming restaurants around the area. Instead of depriving you of an opportunity to try the local establishments, Makati Diamond instead encourages their guests to try the restaurants outside its establishments through the use of their Dining Card. The complimentary breakfast privilege you regularly enjoy at Alfred can instead be availed outside of the property at the partner restaurants that have selected for you, giving you endless dining options during your stay! It was truly a phenomenal weekend with the KTG family, and Rain had a blast with her friends! A heartfelt thanks to Pau Esmedilla and his team at Makati Diamond Residences for showing us a new standard of luxury here in the Philippines! Prost! It's Oktoberfest at Alfred! 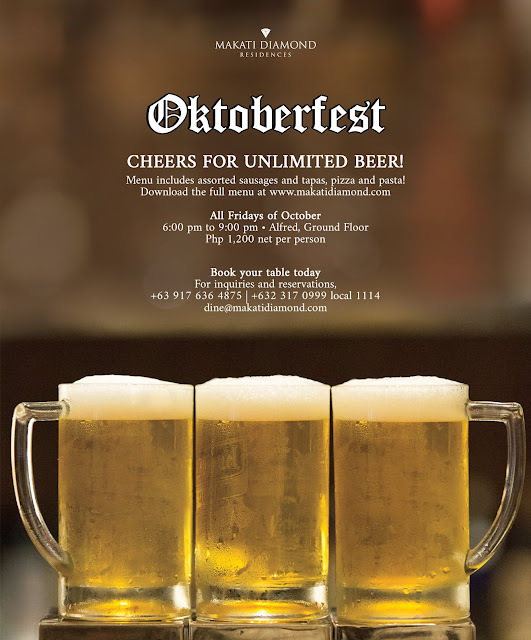 Get unlimited local beer, assorted sausages, tapas, pizza and pasta for only Php 1,200. Promo is available all Fridays of October from 6 pm to 9 pm. For seat reservation or inquiry, call +63 917 636 4875 or email dine@makatidiamond.com.